On the last weekend of September, Manufacture New York hosted a two-day weekend exploration into local textile production and sustainable fashion practices. This event included hands-on workshops and panel discussions that furthered the dialogue surrounding locally sourced materials in the fashion supply chain. From Farm to Fabric brought together leading artists, designers, and makers in New York City and its environs. Participants traveled across the United States, as well as from China and Australia, to attend the workshop and symposium. 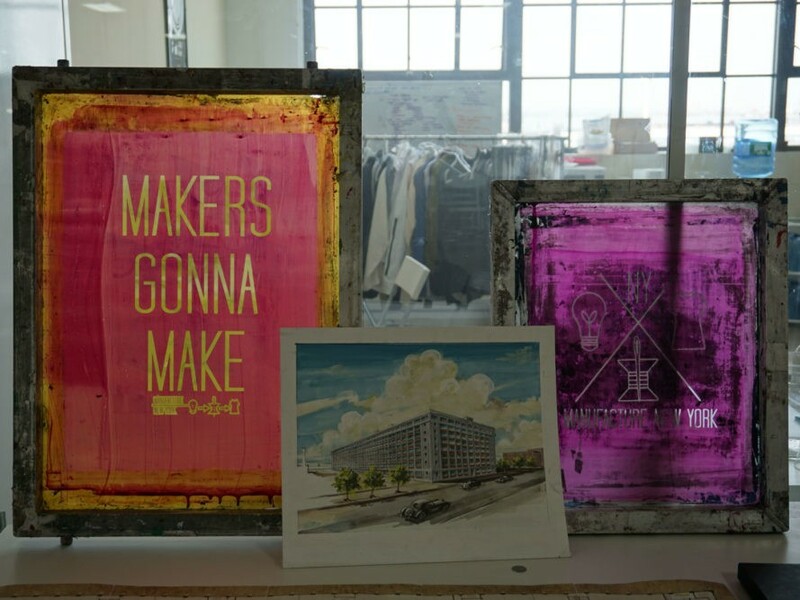 The curriculum was designed to provide an overview of New York’s local supply chain and fiber-farming community, introduce designers and students to ethical sourcing and textile development, and allow participants to experience the excitement that is palpable in Manufacture New York’s Industry City flagship location. The desire for “made in the U.S.A.” products is on the rise, and emerging New York based designers are capitalizing on the growing demand for locally manufactured designs. While manufacturing garments locally is a solid step in ensuring that the actual construction process is monitored and workers’ rights and ethics are being acknowledged and fulfilled, in reality, the supply chain is much more complex. The average garment is made in multiple countries, then shipped around the globe many times over before it makes it to the sales floor or showroom. The goal of From Farm to Fabric was to explore the steps before assemblage. Natural fibers come from the farm; the raw fiber is then processed, spun, dyed, and then woven or knit. Adriana Lentrichia from Artifact—a company that aims to connect consumers and designers to the New York fiber farming community and ethically sourced textiles—engaged participants in learning how to create their own yarn to be applied in their garments through drop-spindle spinning with local wool. 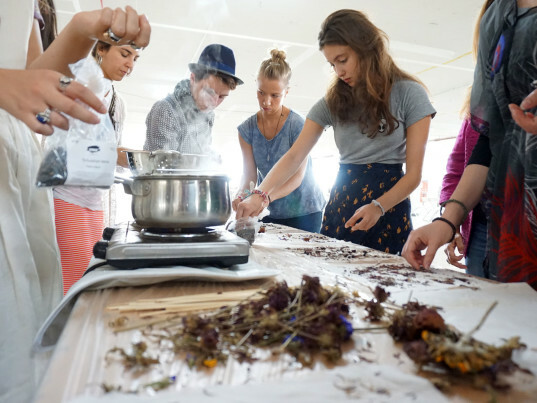 Mimi Prober and Nica Rabinowitz, the event organizers, as well as the heads of education at Manufacture New York, taught bundle dyeing, which is a natural- dyeing method of eco-printing with flowers and natural pigments. Yukako Satone, from Loop of the Loom and Saori Arts NYC, demonstrated the wonders of Bengala dyeing, a cold dye process using mud. 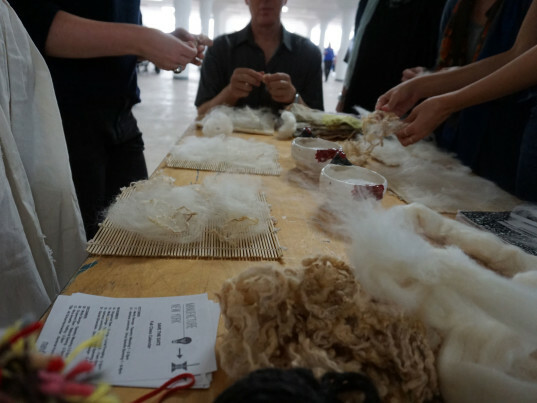 The second day of workshops included felting, i.e., creating your own fabrics by felting natural fibers, with Rabinowitz and weaving on the loom with Molly George of Ghost and the Goodship. Laura Sansone of Textile Lab and Parsons The New School for Design demonstrated indigo dyeing with fresh indigo leaves picked that morning from a community dye garden in Beacon, NY, while participants used Green Eileen clothing to explore the wonders of fresh indigo. The Dogwood Dyer’s Liz Spencer also engaged people with living color through painting with natural dyes on silk. In addition to the hands-on workshops, the event also held two panel discussions that covered both the topic of fashion and textiles. Saturday’s “Local Textile Creation” panel, moderated by Sansone, brought together Genspace’s Ali Schachtschneider, who creates her own textiles from bacteria and mycelium; Pascale Gatzen from People of the Light; and Holly Henderson of Simply Natural Clothing to discuss the need to shift value systems within the industry. Sunday’s “Sustainability in Fashion” panel featured Sass Brown, associate dean at the Fashion Institute of Technology and the author of Re-Fashioned and Eco Fashion; Timo Rissanen, assistant professor of fashion design at Parsons The New School for Design and the author of Zero Waste Fashion; and designers Daniel Silverstein and Mimi Prober who have their studios based within Manufacture New York’s groundbreaking space. This discussion discussed new dialogue and current events on locally produced, ethical, and zero-waste design. 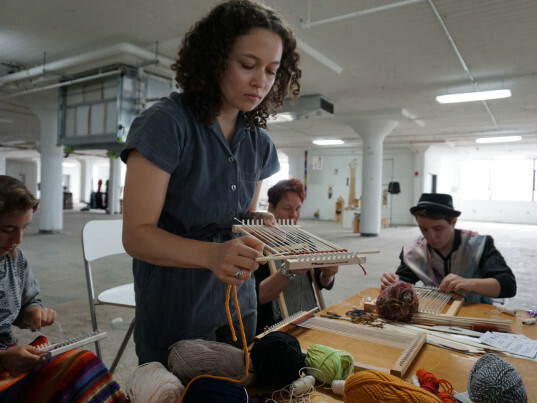 The From Farm to Fabric workshop and symposium was a launching event for an entire fall calendar of classes at Manufacture New York that will explore what it means to be made in New York and continue the learning initiatives introduced at the Symposium. The goal is to turn talk into action and to create viable alternatives to the broken fashion system.